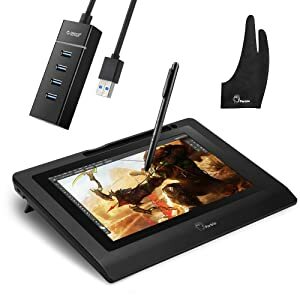 Here are top ten best drawing tablets for the creators, illustrators and graphic designers to draw tables, images and illustrations with more details in less time. If you are a graphic designer, an artist, or a person who sketches or paints, it is ideal for you to take out your pen, pencil or brush to draw something creative on the piece of paper sheet. But the digital age wants everything digital. Therefore, nowadays, many creators, illustrators, and graphic designers use drawing tablets to do their projects on a more sophisticated platform. It is useful for them to get rid of the paints and brushes, and draw the images with more precision, detail, and in less time. The drawing tablets come in different sizes along with various features. Some offer large active areas whereas some have less screen resolution. Also, some tablets have good pressure sensitivity levels but lack some advanced features. 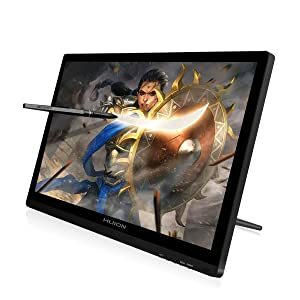 In a nutshell, it is not easy to purchase the best drawing tablet without researching as there are many available in the market. Therefore, to make the selection process easier for you, we have reviewed the best drawing monitors and listed them below. Also, we have a buyer’s guide where you will find different factors that are required to consider when purchasing the best drawing tablet. One of the best graphics drawing tablets for the creators and artists is the H610 from Huion. It is a thin and lightweight drawing pad that has a large drawing area of 10”x 6.25” to allow the users to draw without any restrictions. The drawing tablet provides the most realistic drawing experience because of its upgraded papery textured surface. It is also featured with eight press keys on the left side, and the sixteen hot soft keys are located at the top of the tablet. All keys are customizable and have different functions to provide you every bit of convenience while drawing. Also, the tablet is made for both the right and left-handed individuals. The rechargeable drawing pen is easy to grip that allows drawing more efficiently and effectively. The pen is equipped with every two programmable buttons and has 2048 levels of pressure sensitivity. The GAOMON PD1560 is another good quality drawing tablet that you can prefer for your drawings. It has a large IPS Full HD screen of 15.6” with a screen resolution of 1920 x 1080. 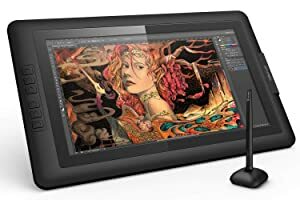 But has a drawing area of 13.5 x 7.6 inch that is enough for creating masterpieces and ensures quality and precision of the image color and lines. The tablet is featured with ten shortcut keys that you can customize according to your needs to make your creations more efficient. Also, there are five menu keys available on the left side of the display. Moreover, the tablet is for both the right and left-handers and comes with an adjustable stand. If we talk about the drawing pen, then it is as good as it could be. It allows drawing with more accuracy and provides a realistic drawing experience. Also, it comes with 8192 levels of pressure sensitivity. 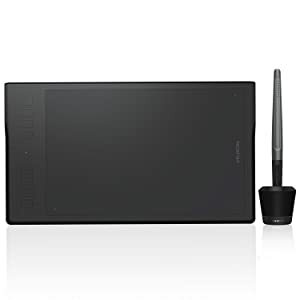 The KAMVAS GT-191 is a good quality drawing tablet from Huion that you can consider for your creative drawings. It has a large 19.5-inch IPS LCD screen with full HD resolution of 1920 x 1080. 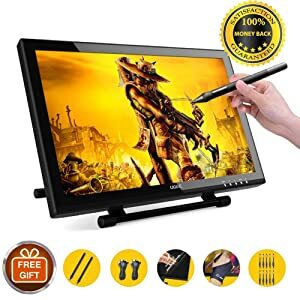 Also, the screen helps to produce good quality artwork with a 72% NTSC color gamut with a good contrast ratio that displays all the colors strongly. Moreover, the screen of the tablet is anti-glare and eye-protected to keep it safe from scratches and dirt. Also, the 233PPS report rate and the 5080LPI drawing resolution provides a better display effect. If we talk about the drawing pen, then the tablet comes with two light-weight pens with the 8192 pen pressure level that provides accuracy along with enhanced performance. Also, there is a new pen stand with a built-in nib extractor. 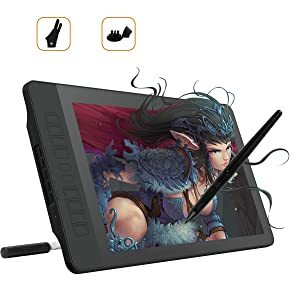 Another graphics drawing tablet from Huion is the Q11K that can work for 40 hours without a need for power connection. The built-in 2500mAh lithium-ion battery allows the tablet to work wire-free. Also, wireless connectivity makes it easy for you to stay connected with the network from anywhere. The tablet has a large working screen of 11 x 6.87 inches that allows you to create your drawings without any limitations. Also, its 5080LPI drawing resolution makes your pictures come to life. The tablet also supports eight customizable shortcut keys that you can use for increasing the efficiency of your work. Moreover, both the right and left-handers can easily use the drawing monitor. The drawing pen is rechargeable and is of very lightweight. Also, it is equipped with two programmable buttons and has a pressure sensitivity level of 8192. Additionally, the pen can work up to 350 hours with 15 hours of charging. 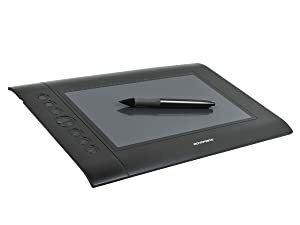 The regular edition of the Wacom Intuos Pro digital drawing tablet comes with a footprint display of 16.8 x 11.2 inches with a drawing area of 12.1 x 8.4 inches. It is a super slim tablet that has a super sensitive pen having a pressure sensitivity level of 8192. Also, the pen supports tilt response and lag-free tracking to provide the best creative control. The tablet supports Bluetooth classic to connect wirelessly with the PC or Mac. Also, it is equipped with a USB port. Moreover, the multi-touch gestures allow you to work smoothly as you do on your smartphones. The Express Keys are eight in numbers that are best for creating shortcuts to make them useful for everyday drawing. Also, the tablet is compatible with Windows 7 or later and Mac OS 10.10 or later. A decent drawing tablet with decent performance is from Monoprice. It is a 10 x 6.25-inch tablet that allows you to create your drawings efficiently and effectively. Also, a 200 RPS report rate and the 4000 LPI drawing resolution can turn your imaginations into exceptional creativity. The tablet is featured with eight customizable express keys along with sixteen hotkeys that can be used for different functions. The express keys are displayed on the left side, and the hotkeys are placed on the upper side of the drawing area. Other than this, the Monoprice tablet has a drawing pen of 2048 pressure sensitivity level and uses the USB interface. Also, it is compatible with Windows XP or later and Mac OS 10.4x and later. The drawing monitor from XP-Pen is featured with a 15.6-inch drawing space area that is ideal for large and creative drawings. The tablet comes with a screen resolution of 1920 x 1020, and the 178-degree visual angle makes the images sharper and brighter. The Artist 15.6 is also featured with an excellent quality glass design that provides excellent precision while working. Also, the pen has a pressure sensitivity level of 8192 that is ideal for drawing. Moreover, the table is equipped with six customizable express keys for efficient working. The main drawback of this drawing monitor is that the IPS panel has not as good colours as other IPS panels have. But the other good features of the tablet include 4K display support, 266RPS report rate, and the right and left-handed user support. 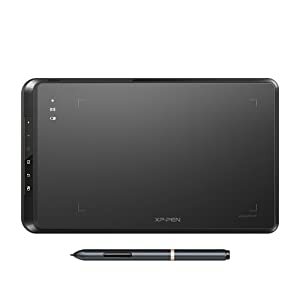 The XP-Pen Star05 graphics drawing tablet has not a large working space area, but its 8 x 5 inches space is enough for drawing and painting comfortably. The tablet is featured with both wired and wireless connectivity options. It uses the latest 2.4G and FHSS technology to allow you to connect wirelessly with your computer. It comes with a battery-free working pen having a pressure sensitivity level of 2048 with more precision and control. Also, the tablet is featured with six touch-sensitive shortcut keys to make your daily drawing more convenient. But the main problem in this tablet is that the cursor randomly shoots off to the screen corner. Moreover, it is also equipped with a lithium battery that provides 14 hours of non-stop work with 2.5 hours of continuous charging. Also, the tablet works well with Windows 7 or above and Mac OS 10.10 or above and is compatible with different major drawing software. Another good quality drawing pad that you can consider for drawing and painting is from Parblo. 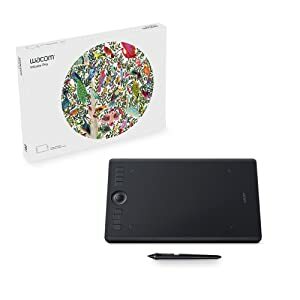 It is a 10-inch tablet that is very light in weight and connects with the computer or laptop to display while you draw. It offers 170 degrees vertical and horizontal viewing angles so that you can always have a perfect and complete view of your drawings. Also, its battery-free pen having the 2048 levels of pressure sensitivity allows you to have realistic drawing experience. The tablet is also featured with a portable USB 3.0 hub containing four ports. Also, it is compatible with different major graphic designing applications. The main drawback of this drawing monitor is that there is no touch sensitivity and the pen lags with rapid strokes. Last but not the least drawing monitor is the Ugee 1910B. 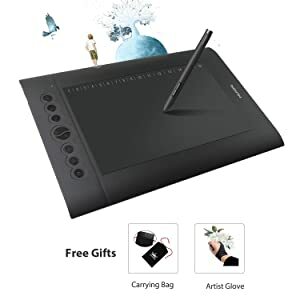 It is an average drawing tablet that you can consider for regular painting, drawing, editing, and sketching. The tablet comes with a large screen with 19 inches of active area to make you draw anything without any limitations. The tablet’s screen resolution is 1440 x 900, and it comes with an adjustable stand to allow you to draw more comfortably. Other than this, it has a rechargeable drawing pen having a pressure sensitivity level of 2048. Also, the tablet works well with different good software and is compatible with Windows 7 or above and Mac OS. But if we talk about the drawbacks, then the screen is not full HD. Also, the colors available are not accurate. The drawing surface area of the tablet is the first thing that is required to consider. The artists, creators, always prefer large drawing areas, and graphic designers to draw, sketch, and paint without any limitation. Also, there is no need for zooming and panning if you work on large drawings. So, it is always good to go with a drawing tablet that has a large active area. But it all depends on your needs and the type of work you do. Also, if you travel a lot, then it is ideal to go for compact-sized tablets. The pressure sensitivity level of the tablet is another factor that you should consider. Depending on your drawing or illustration style, you should choose the tablet accordingly. The tablets usually come with a pressure sensitivity level range of 300 to 3000. The more the pressure sensitivity level is, the more responsive the tablet will be for you, and you will be able to differentiate more between the thickness of the lines. For beginners, the pressure sensitivity level should be 1024. But, if you are a professional and have more creative work to do, then you should go for a tablet having 2048 pressure levels. How many lines per inch (LPI) your tablet displays is what the screen resolution refers to. If you create more detailed and high-resolution images, then the tablet with the higher LPI is the best one for you. A comfortable stylus or drawing pen is the need of every artist. The pen that is easy to grip and that makes the drawings more comfortable to draw is what all matters. But again the type of stylus you prefer is based on your needs and preferences. There are battery-powered styluses, rechargeable styluses, and the EMR styluses available in the market. EMR styluses are the latest ones. They don’t need any charging or power to operate. They catch the power from the tablet and run correctly on the tablets without any interruption. The battery-powered and rechargeable styluses are commonly used. The main problem with the battery-operated drawing pens is that they are thicker as they contain batteries. It is not easy to hold or grip these pens if you have small hands. On the other hand, rechargeable styluses are thin and easy to grip. All you need is to make them charge like a phone before using. Hotkeys or shortcut keys are best to have in your tablet. Different tablets offer built-in Hotkeys to make your work more efficient and effective. These Hotkeys are very useful and save a lot of time for the creator. Some tablets allow you to customize the keys according to your needs. Also, there are some that automatically program the keys and turn them into shortcuts according to your usage. So, it is essential to make sure that your ideal tablet has built-in Hotkeys. Some tablets come with built-in screens and there are also other drawing tablets that come without displays. So, it is also necessary to make up your mind whether to go with the one that has a display or with the one without a display. First of all, if you are a beginner, it is ideal for you to purchase a tablet that has a built-in display. It is not easy to focus on both the computer and the tablet at the same time. Also, these tablets are best for professionals and creators who create high-quality drawings. They are the expensive drawing tablets as compared to the non-display ones. But if we talk about the non-display tablets, then they are cheaper and more durable. You need to connect the tablet with a computer through a USB cable. When you draw the lines on the surface of the tablet, they will appear on the computer screen. So, the selection is completely based on your convenience. Also, the selection of the wireless or wired tablet is based on your needs. If you want to stay connected with your workstation, then you can go for the wired tablet. But if you wish to mobility, it is ideal for selecting a wireless tablet.